Farewell 2010 and welcome 2011! and a lifetime of beautiful tomorrows! As beautiful and bright as the red Anthuriums below! Count your age by friends not years! Blessed New Year to you Jacq. May God bless you and keep you safe and strong. And that you also continue to bless all of us with your wisdom, knowledge & understanding in all our garden task. And the rewards of your handwork goes forth from generation to generations. Henceforth all will call you blessed. For the favour of God is always with you. and wish a Great Year 2011. Aw…such wonderful blessings and sweet thoughts, James! Thank you very much, my friend! 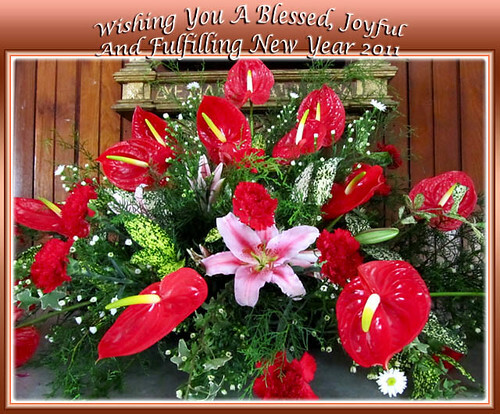 A great New Year to you too and may your blessings be many and enduring! God bless!